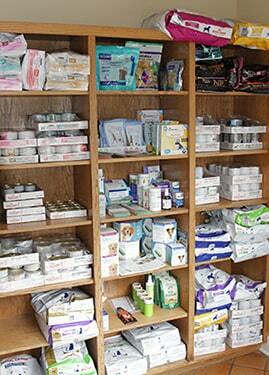 Pet nutrition is one of the most important topics involved in maintaining good health. Old Dominion Animal Hospital can help you find the right diet for your pet’s particular age and lifestyle. If your pet is not healthy or energetic, our Charlottesville veterinarians can help to determine the best pet nutrition plan for their individual lifestyle. More than 50% of pets over three years of age are over weight, and simply by maintaining your pet’s proper weight you can increase your pet’s lifespan by two years. Old Dominion Animal Hospital is also pleased to offer a wide range of prescription and holistic veterinary diets for your pets including: Hill’s, Purina, Royal Canin Hypo-Allergenic, and Aunt Jeni’s Home Made All Natural Raw Diet. We try to keep a wide variety of products in stock, but we are also happy to order any of our products especially for your pet.